Hugh B. Brown tried several times to end the priesthood and temple ban in the 1960s. On June 1, the LDS Church is hosting a celebration of the 40th anniversary of Pres. Kimball revelation lifting the ban. But it could have been a decade sooner under President McKay. In our conversation with Dr. Matt Harris, he will describe several of Brown’s attempts to persuade McKay to lift the ban as early as 1962, and almost succeeded in 1969! Even though rebuffed, Brown didn’t stop trying. He made one final attempt in 1969 and almost succeeded. However, the attempt was nixed by Harold B. Lee. Dr. Matt Harris will give us more information on this, and I think you will hear some really amazing stuff in this next episode. 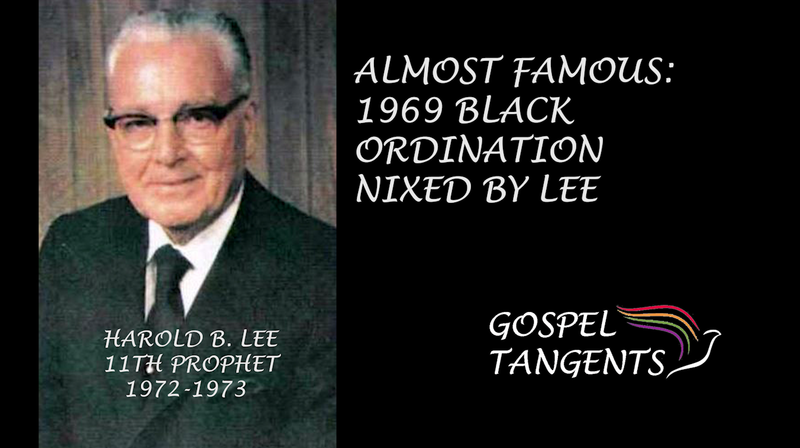 Harold B. Lee thought black ordination was improper and supported segregation. I can’t wait for Matt’s book to come out to learn even more about his groundbreaking research. What are your thoughts on Brown? What are your thoughts on the ban as we approach what could have been the 50th, rather than 40th anniversary? JI, I am glad you liked the presentation, but continually asserting the “matter is behind us,” doesn’t make it so. The hoax apology shows us that your repeated assertion is simply not true. May we look at the past so it doesn’t get repeated, learn to be kinder to each other, and fight injustices against immigrants and people of all races and ethnic backgrounds. But the matter of race and priesthood is wholly behind us. The hoax apology shows us that your repeated assertion is simply not true. I think it is very clear, both as a matter of policy as well as a matter of practice, that the priesthood is available to all men without regard to race. I’m glad for that. I think it is very clear, both as a matter of policy as well as a matter of practice, that there is still racism in the church. I’m sad for that. Wherever racism exists, I’m sad, too. I’m ashamed to be associated with a church that held such racist views, and don’t feel celebratory at being reminded of that fact. As far as I’m concerned we’d be better off getting on with enacting a truly integrated church. I’m wondering how it feels for my black sisters and brothers to be reminded that it was not always like this. Certainly can’t be helping our young people who haven’t necessarily been aware of this, or the crazy doctrine associated with the ban. Our poor seminary and institute teachers and parents of students could live without this I’m sure. Handlewithcare, I understand that at least other Christian churches in the US and UK held such racist views in the 19th century and well into the 20th. I’ve read that most, not having a “lay priesthood” but requiring study in a seminary (not the Mormon-speak meaning of that word), accomplished preventing blacks from attaining “priesthood” by the simple expedient of not allowing their admission to seminaries. Maybe a historian can confirm. Supposedly that led to the formation of black churches (Episcopal, Methodist, etc.) with their own seminaries. Such churches were quite independent of their white counterparts. None of that is a good excuse for how long such racism persisted in the LDS church, but LDS ideas of priesthood hierarchy, ordination, revelation, “doctrine” and historical continuity made it much more difficult to make a change and effectively precluded the formation of a black LDS church that could claim authority in the same way US black Christian churches did. I am appalled at the thought of a “celebration” of the 1978 revelation just because it functions as a reminder to me — not of the general racism of Anglo-American Christianity — but of how long it took the LDS church to get to that point. I’d feel better about it if someone could tell me it was initiated by black Mormons and not by the church hierarchy. I’ll be pleased only if it includes a no-holds-barred apology on behalf of the church. I rate the likelihood of that at zero %. “I am appalled at the thought of a “celebration” of the 1978 revelation just because it functions as a reminder to me — not of the general racism of Anglo-American Christianity — but of how long it took the LDS church to get to that point. I’d feel better about it if someone could tell me it was initiated by black Mormons and not by the church hierarchy. I’ll be pleased only if it includes a no-holds-barred apology on behalf of the church. I rate the likelihood of that at zero %.” JR, I’m appalled also. I just don’t understand. Although I’m excited to hear Gladys Knight. Do we suppose there are members of the 15, and others respected by them, working to resolve the present discrimination, against women and non hetrosexuals? Wouldn’t it be good to know? I was on the other side of the world in the time discussed above, was it known the Hugh B was doing this in Utah at the time. Hugh B was a Canadian, pesky progressive foreigner. Of course it is complete speculation, but Dieter Uchtdorf got booted from the FP, just like Brown. Christofferson has a gay brother, so of course they trotted him out to defend the PoX, right after that kerfuffle. It certainly makes you wonder, but it may take 30 years to know for sure. Wowsers, I’d like to see the citation for the last quote in the OP (calling the president of Stanford). I’m not questioning it necessarily, but I’d like to see the provenance of the quote. Bro Jones, You’ll have to wait for the book (tentatively 2019)! I know I’m way late to this conversation, but Sterling McMurrin’s account of the 1963 “declaration” by Hugh B. Brown is somewhat different than Dr. Harris’. Dr. Harris made it sound like Pres. Brown’s announcement was to prevent a demonstration, whereas Sterling McMurrin claims he’d encouraged the NAACP (he was a member) to meet with the church before holding the demonstration to ask for assistance rather than simply protesting. He arranged a meeting between Pres. Tanner and Pres. Brown and the NAACP, but the NAACP did not threaten the church with the demonstration, merely asked for the church’s support for the civil rights legislation. Subsequently, he stated that he, Sterling McMurrin, was the one who proposed they wait to protest until after the Sunday morning conference session, in case the church made an announcement to their liking.